VLADIVOSTOK, Russia, July 15, 2018 (ENS) – Only 84 Critically Endangered Amur leopards, Panthera pardus orientalis, remain in the wild along the southernmost border of Primorskii Province in Russia and Jilin Province of China, according to the latest scientific estimate. This new estimate of the Amur leopard population was recently reported in the scientific journal, “Conservation Letters” by scientists from China, Russia, and the United States. 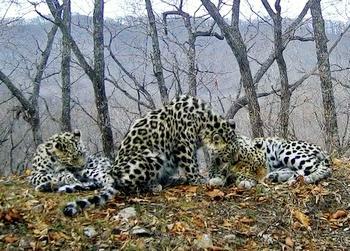 The scientists collated information from camera traps on both sides of the Sino-Russian border to derive the estimate. Because there are no records of leopards in other parts of its former range, this estimate represents the total global population of Amur leopards in the wild. Previous estimates in Russia were even fewer, ranging from 25 to 50 individuals. However, those surveys, based on tracks left in the snow, were extremely difficult to interpret due to the unclear relationship between numbers of tracks and number of individuals. With camera traps, each individual can be identified by its unique spot pattern, providing a much more precise estimate. Combining data from both countries increased precision of the estimate, and provided greater accuracy. 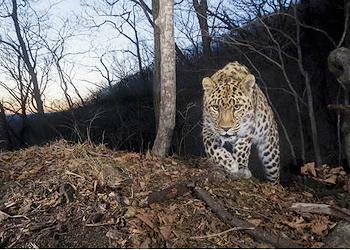 About one-third of the leopards were photographed on both sides of the Sino-Russian border. Despite the movement, there were differences in population dynamics in Russia versus China. Leopards are now recolonizing habitat in China by dispersing from the Russian side, where leopard numbers appear to be close to the maximum that can be supported. Financial support was was provided by ANO Far Eastern Leopards, ALTA, the National Natural Science Foundation of China, the National Scientific and Technical Foundation Project of China, the National Key Research and Development Program, the Wildlife Conservation Society, WCS, based in New York City, and the Liz Claiborne and Art Ortenburg Foundation. The WCS Russia Program works to protect the extensive forest and tundra ecosystems of the Russian Far East and the species whose survival depends on these intact, functional ecosystems. WCS Russia uses science as a foundation for designing and implementing conservation actions for many species of wildlife, including Amur tigers, Far Eastern leopards, Kamchatka brown bears, and Blakiston’s fish owls.